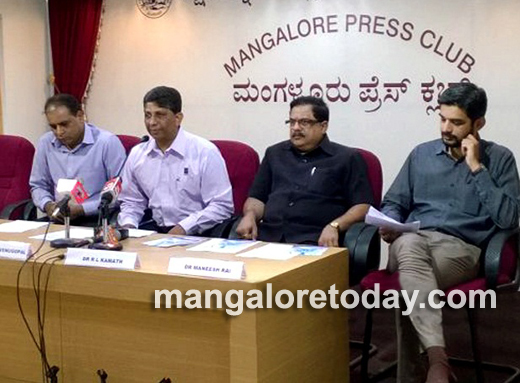 Mangaluru, July 9, 2015: KMC Hospital, Mangaluru will introduce latest technology Rotablator and 3D mapping system. Dr Annapoorna Kini, director Cath Lab and Interventional Cardiology, professor of cardiology, Mount Sinai School of Medicine, NY will inaugurate the rotablator on Friday. Dr Jayaprakash Shenthar, professor, electrophysiology unit, Sri Jayadeva Institute of Cardiovascular Science and Research, Bengaluru will inaugurate the mapping system on Saturday. Dr Anand Venugopal, medical superintendent, KMC Hospitals, Mangaluru told reporters here on Thursday, "Team of Cardiologists at KMC Hospital Managluru are experts in handling any cardiac case. With the addition of the only cardiac electrophsiologist in coastal Karnataka in Dr Maneesh Rai K, the department can handle specialized treatments required for arrhythmias, syncope and heart failure devices for which patients had to travel to metro cities before." Dr R L Kamath, HOD of cardiology said, "Rotablator technology can remove plaque by abrading atherosclerotic material producing millions of micro particle smaller than RBC which are cleared by RE System. It improves success rate and reduces restenosis rate in coronary angioplasty. The 3D mapping system can treat complex tachy arrhythmias with better accuracy and efficiency." Tachy Arrhythmia, is a heart condition whereby heart rate increases to alarming rates. The patients treated by cardiologists specialized in electrophysiology study and radiofrequency ablation thus being known as cardiac electrophysiologists. The latest technology known as 3D cardiac mapping will help electrophysiologist to localize the area of reason for tachycardia to utmost accuracy using highly sophisticated Algorithm with minimal of x-rays and give painless catheter ablation to the spot thus providing better solutions to patient’s arrhythmic woes. Saghir Siddiqui, unit head, KMC Hospital said, "We have taken new stride in enabling the electrophysiologists to have better control with this facility and less risk during EP procedures culminating in improved and better treatment of its patients. In additional to this, hospital will conduct a CME for doctors at Hotel Ocean Pearl on Friday. Dr Jayaprakash Shenthar will deliver a lecture on "Utility of 3D mapping for Mapping and ablation of Complex Arrhythmias".